Simple, rarely auriculate, lamina lanceolate, base attenuate, apex acuminate, margin entire 40-160 x 5-25 mm. Indumentum adaxially glabrous to sparsely hirsute to densely hirsute with long appressed hairs, abaxially with long appressed hairs interspersed with short glandular hairs. petiole 2-11 cm. Stipules subulate, adnate to petioles for half to two thirds of their length, 8-40 mm. Branched, with 2-6(10) pseudo umbels, each with 4-15 flowers. Peduncle 2-13 cm, hirsute with distally appressed curly hairs interspersed with glandular hairs and sometimes long patent hairs, pedicel ~0.5 mm. 5, lanceolate, 6-12 x 1-3 mm, posterior erect, others reflexed. Hypanthium (10)15-44 mm. Petals 5, cream-coloured, yellow, orange-pink to pale pink, claws forming a floral sheath, posterior two with wine-red feather-like markings, ligulate to narrowly spathulate, apices obtuse or rounded, 20-36 x 2-4 mm, anterior three with a win-red stripe on the claws, ligulate or narrowly spathulate, apices rounded or obtuse, 17.5-33 x 1-3 mm. 4-5 fertile, posterior 1.5-4 mm, lateral two 2.5-5 mm, anterior two 4-6 mm. 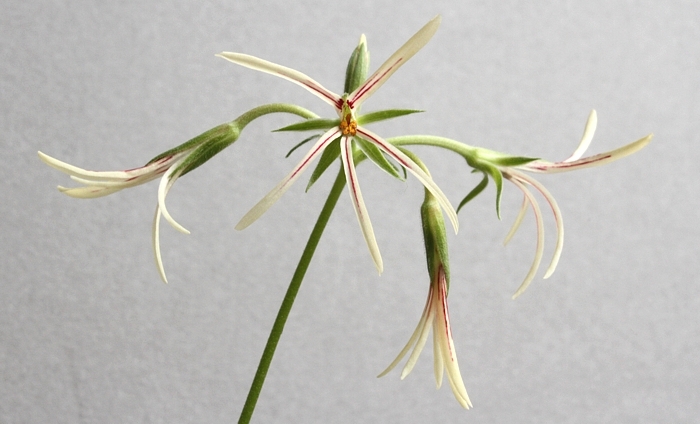 An extremely unusual plant from Dasklip Pass, for the time being let's say this is P. longiflorum. 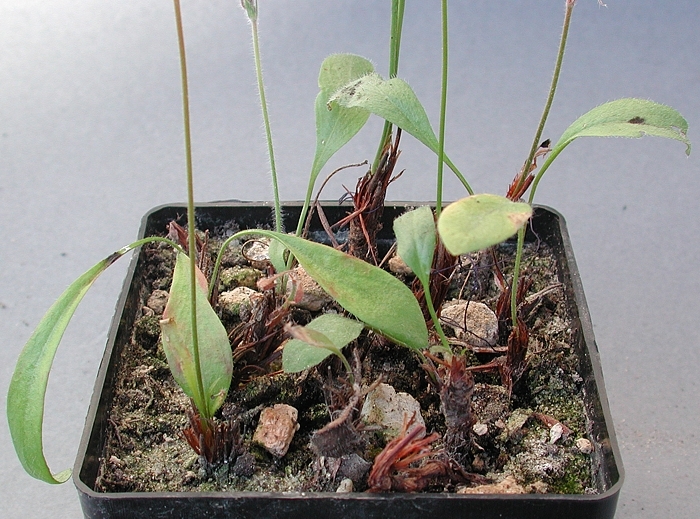 It has curiously pinnate leaves, entirely uncharacteristic of this species. 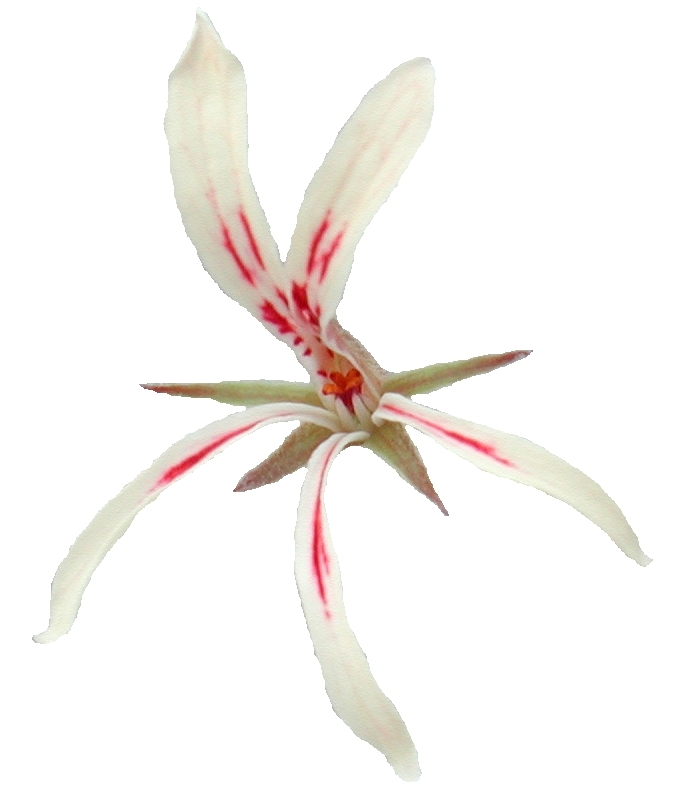 The flowers of the Dasklip Pass plant are within the description of P. longiflorum, although the posterior petals are extremely narrow, often narrower than 2 mm. This pass is not a very touristy destination, except for paragliders, but the views are magnificent. 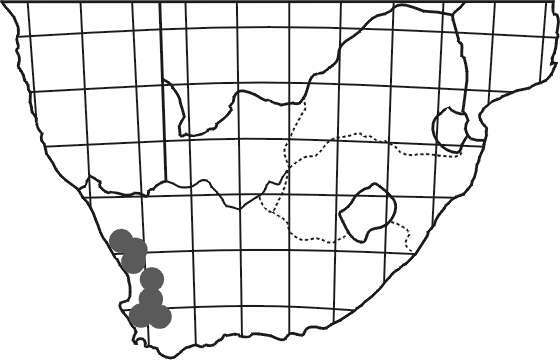 Numerous pelargoniums grow here, P. asarifolium is a common hoarea species, and P. triste (for a view from Dasklip Pass see there) is another geophyte. 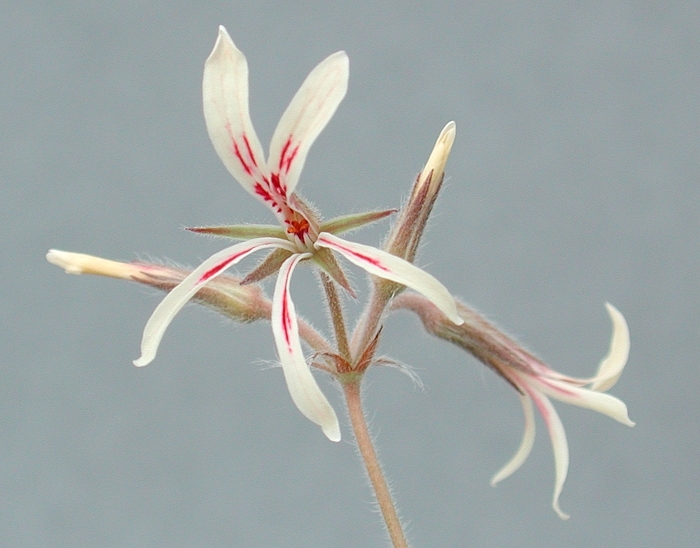 Another flower of P. longiflorum from Dasklippas, this one quite typical of the species. affine (Poirr.) G. Don nom. ill.